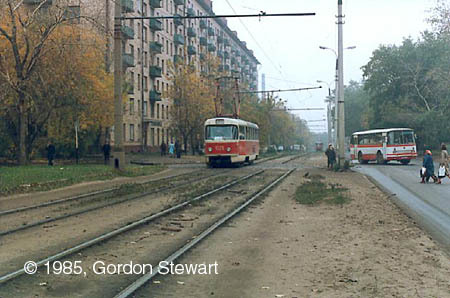 A tramline along Zvenigorodskoye Shosse and Sergey Makeyev Street was constructed in 1960 as the replacement to a closed up line on a parallel reconstructed street. Unfortunately, fourty years later no compromise could be found. Or, more probably, Those Who Decide just did not want to consider options for saving the line. As the construction of this line dates back to 1960 as it has just been mentioned, the line had been already separated from a motorcar traffic according to the current standards of those years. 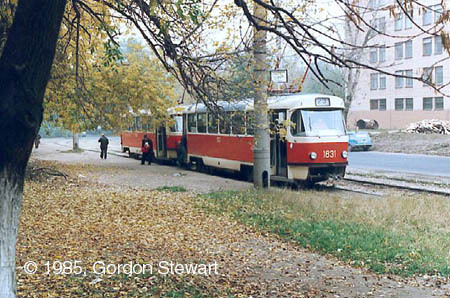 The district it ran in never had high traffic until 2000, and were it not for force majeure of total reconstruction tram could operate here without any problem for many a year. Zvenigorodskoye Shosse begins here, from Krasnopresnenskaya Zastava Square and crossroad with 1905 Goda Street. 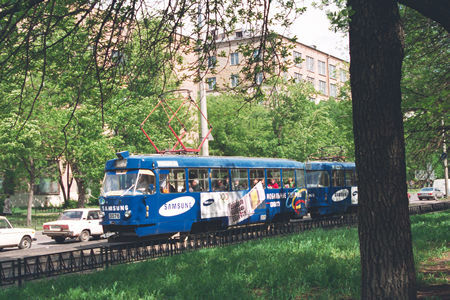 A train on route 23 in Zxenigorodskoye Shosse. A few trees have still survived from construction works, but they are left just some weeks. 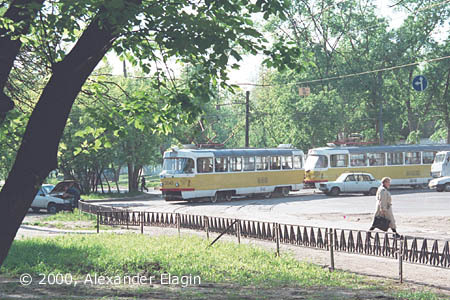 Zvenigorodskoye Shosse in the spring of 2000 still was a green narrow lane. I am sure that nobody could recognize this place today. The same green and narrow lane it was decades ago, as you can easily mention looking at this photo. 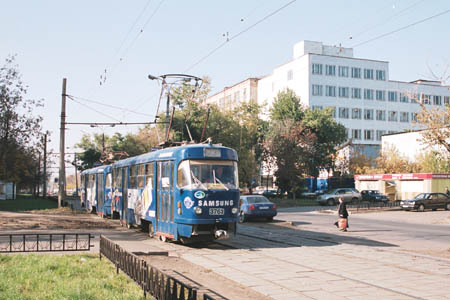 Ulitsa Sergeya Makeyeva stop. This place had remained practically unchanged until the autumn of 2000, when road builders came to lift the tracks. 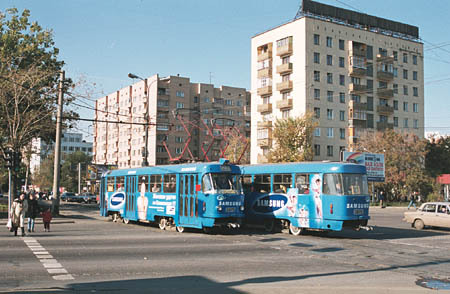 A set of two Tatras is making a turn from Sergey Makeyev Street to Zvenigorodskoye Shosse.